So far, I’ve been posting about individual products that I’ve wanted to remember. This time, I’m going to give you a little list based on the below photo. I took this photo for Threadless, a t-shirt company where people submit illustrations, members of the community vote on them and the company then prints and sells the winning designs as t-shirts, hoodies, prints and baby clothes. I really dig Threadless because of the community involvement they inspire: anyone can submit an illustration. anyone can join and vote. anyone can purchase items. AND if you post a pic of yourself, or a friend, wearing one of the shirts you bought, they give you a credit of $1.50 toward another purchase on their site. 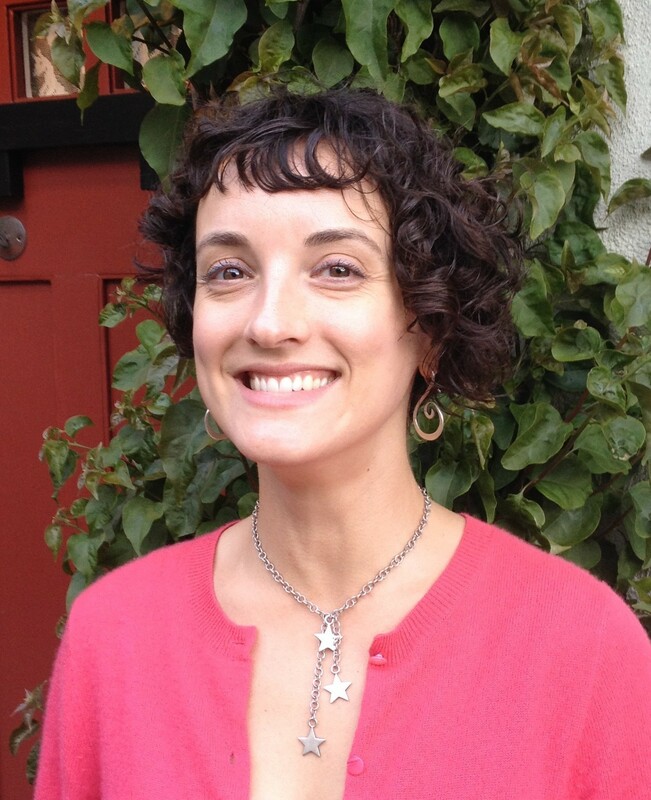 Many people post simple self-portraits just to show that they are wearing the shirt. I started that way (see my first two submissions on the bottom) but now I like to take the opportunity to make a game of it (see photos above the bottom two). 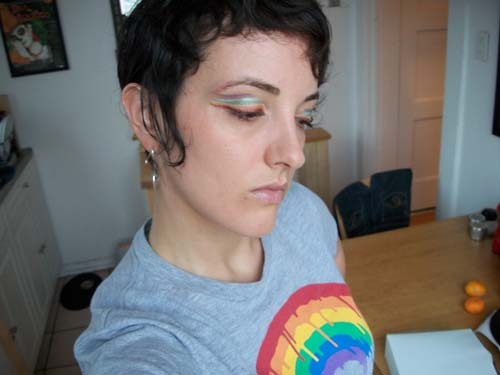 This isn’t actually the photo I submitted for the shirt called Rainbow Worrier (you’ll have to look at my profile to find out) but I wanted to use this one here because of the way it highlights the eyeshadow piece. 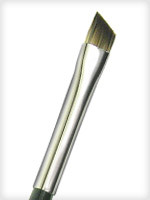 Being True Glide Definer Brush allowed me to control the shadow application – most of which were loose, not cake, powders. 2. Cargo 100% Natural Origin Eyeshadow in Ginger (which isn’t online for some reason…I got it from Sephora as a bonus item) It’s too bad I can’t find this one online because it’s a beautiful neutral shimmer and I love the little palette it came in. 4. Urban Decay Deluxe Eyeshadow in Graffiti – the Deluxe Eyeshadow line is awesome – rich, deeply pigmented colors with great lasting power. I love this line! 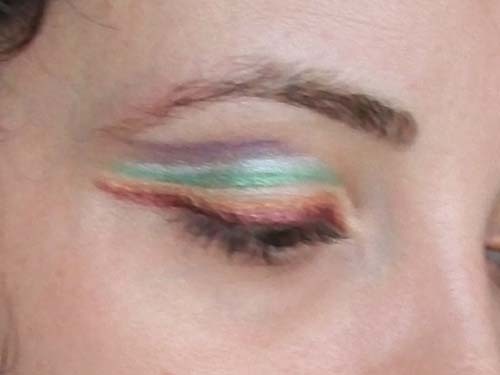 I like the Bare Escentuals colors but find that the loose pigments get stuck in the creases easily if you’re not loaded up on lid primer. I’m not sure I would buy more for myself but I’m thankful to my esthetics schoolmate Jessamin for gifting me with all of those beautiful Bare Escentuals colors! Here’s a close up for you. Sorry it’s a bit blurry, like I said, I was rushing and sometimes it’s hard to have a steady hand when taking a selfie!